Sumatra was named overall winner in the 2016 One More Time Regatta, Aug. 27. MARINA DEL REY — The wind and sea did not disappoint as racers in the Wooden Hull Yacht Club’s One More Time Regatta sailed in idyllic weather conditions for the 41st annual event. Held on Aug. 27 in Marina del Rey, the race was open to all wooden hulled boats that wanted to get on the water and test their speed. 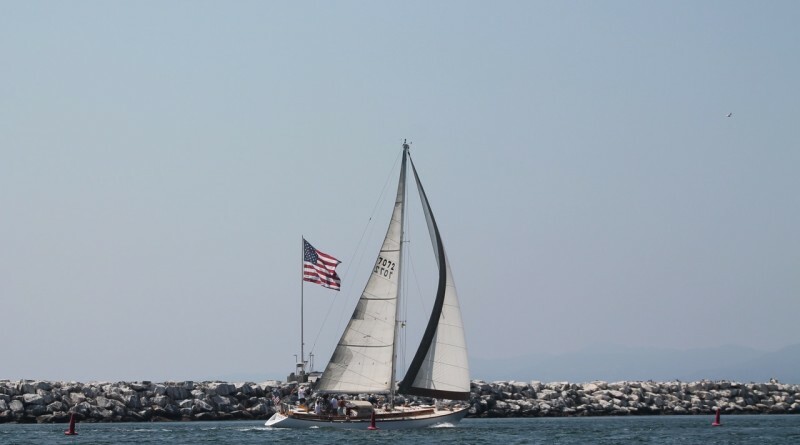 The event presented by the Wooden Hull YC and sponsored jointly by Del Rey Yacht Club and Pacific Mariners’ Yacht Club is the only competition run in Santa Monica Bay exclusively for wooden hulled vessels. By 10:30 a.m. there was a constant 10-knot breeze with winds gradually building to 15-18 knots at ‘T’ marker by the noon start. The seas did not catch up to the winds and this made for ideal sailing conditions, according to race organizers. The 13.6-mile inverted start race was completed by 3:15 p.m. with Sumatra being named the overall winner. Sumatra blasted around the course with a two hour seven minute elapsed time. Bill Durant’s Lapworth 50 sloop was the last starter and beat the 36-foot Herreshoff ketch, Patience, owned by 93-year-old Denton Porter by nearly six minutes. Patience was skippered by Dennis Jensch. Wooden Hull YC Commodore Steve Guilford’s 40-foot. Kettenberg sloop, Antares, came in third overall. After the race the competitors came together for burgers, hotdogs, drinks and trophies at Del Rey YC.